To invest money is very easy but to select investment instrument is very tough job. One should consider various aspects while selecting investment instrument. Safety, Return on investment, Capital growth , Tax minimization are some. 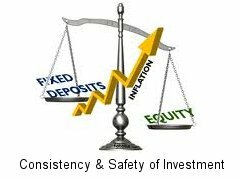 At moneyexcel we consider safety and consistency as most important factor for the regular investment you are making. Consistency means regularity or steadiness, whatever investment you are making should be inline with specific goals. In order to achieve this goal one must invest based on advice at specific interval (Mostly monthly) in specific investment instruments. One should continue doing that based on health of investment instrument & should not stop their investment or don’t make that investment irregular. E.g Person who is earning salary is getting paid every month, consider the case if he/she is not getting salary regularly some times after month sometime after 3 months than what happen ? It will be difficult by him/her to meet daily expense. Similar is the case for self employed he is earning some amount of money every month. If this become irregular than misbalance may happen in daily life, Similar is case for your investment. Based on your goal if it not one time investment and regular investment is required than, you have to be regular once decided to start investing. Irregular investment is not good practice which may lead to diverge you from achieving your main goal. Most Important factor one should consider investing in any investment instrument is safety. Now basic question arise that which investment instrument you can consider as safe. Consider the case of Fix deposit known as FD. If one invest money in FD than it is usually considered as safe investment option because bank usually take insurance under the Deposit Insurance & Credit Guarantee Scheme of India. So capital loss chance in this case will be less / NIL. Similarly one should study investment option carefully so that capital investment will be safe (protected). Like many of us may have heard sentence “Mutual Fund investment are subject to market risk please read offer related document carefully before investing”. It means that investment made like this is risky and if stock market falls than your investment will be at stack. This article is specific for regular investment considering safety. On top of above article your investment decisions should be based on your goals, time frames, age and income group. for example, if you are young and required money after long period you can afford to take risk and try stock market or other risky investment but if you are about to retire or reaching retirement age than it is advisable to go for safe asset.